Russian financial authorities, energy companies and state-controlled banks are stepping up their use of China's yuan currency as Western sanctions spur diversification away from the U.S. dollar. In recent weeks, major Russian institutions have lined up to announce moves to use the yuan, which will likely emerge as the key challenger to global dollar supremacy this century. The dollar's status as the world's reserve currency has amplified the impact of U.S. sanctions imposed last year over Moscow's actions in Ukraine by making financial institutions nervous of violating U.S. rules, prodding Russia to embrace other currencies. Two state energy companies, gas producer Gazprom and its oil arm Gazprom Neft, said they would use more Chinese currency in trade, while Russia's largest bank, Sberbank, has also promoted the use of the yuan. The Russian Central Bank said it was working to create a new funding instrument in yuan, and the Finance Ministry said it was considering issuing debt in the currency. The flurry of announcements came as Washington's reach was dramatically illustrated by an anti-corruption swoop on a luxury hotel in Switzerland that bagged several senior figures at FIFA, the global football association, earlier this month. Washington, which requested the arrests, said the suspects' use of the U.S. financial system gave investigators license to act, but the raid earned a rebuke from Putin, who denounced it as "yet another blatant attempt [by the U.S.] to extend its jurisdiction to other states." "If anything happened, it did not happen on U.S. territory and the United States has nothing to do with it," Putin said. Moscow has looked to China for trade and investment since sanctions and Russian counter-sanctions last year curbed Russia-West trade flows. China is already Russia's second-largest trading partner after the European Union, with a trade turnover of more than $95 billion in 2014, news agency TASS reported citing Chinese customs data. Yet the omnipresence of the dollar in global finance has meant that even non-Western financial institutions have been wary of lending in Russia. A way around that problem is increased use of local currencies. State-controlled Gazprom Neft, Russia's third-largest oil producer, led the pack. The company said this month it had begun settling shipments of oil to China in yuan and using the bulk of the revenue to source equipment in China. Gazprom Neft said it would export 2.7 million tons of oil to Asia this year, up from 1 million tons in 2014. Alexei Miller, head of gas company Gazprom, which owns Gazprom Neft and signed a $400 billion long-term supply deal with China last year, said soon afterward in an interview on television station Rossia-24 that Gazprom was negotiating with China to use yuan and rubles for gas deliveries via a planned pipeline in Western Siberia. Gazprom Neft's swift embrace of the yuan was likely spurred by sanctions, not profits, said Alexei Devyatov, chief economist at UralSib Capital. Lacking the dollar's convertibility, the yuan is a less convenient currency for the company, he said. "It will have caused certain losses," Devyatov said. Sidestepping the dollar also lets companies avoid the time-consuming risk checks put in place by Western institutions following the imposition of sanctions. "Western banks work slower, with more restrictions, and it becomes simpler to move to the currency in which trade is being done," said Vladimir Pantyushin, senior strategist at investment bank Sberbank CIB. Also this month the first deputy governor of Russia's Central Bank, Ksenia Yudayeva, said the regulator was in talks with banks over a new funding instrument in China's yuan currency. "Talks with banks are going on, a discussion about which concrete instrument there will be. We have sent them proposals, now their responses have arrived. We will discuss the matter further," Yudayeva said. The Central Bank last year opened a 150 billion yuan ($24 billion) swap line, but has so far not made use of it. Sberbank on June 5 said it had issued its first yuan-denominated promissory notes as part of agreement with the Export-Import Bank of China to finance a pharmaceuticals import contract worth more than 29 million yuan ($4.7 million). Sberbank said in a press release that increased cooperation with the Chinese bank "expands Sberbank's possibilities to finance clients' foreign trade with Chinese counterparties." 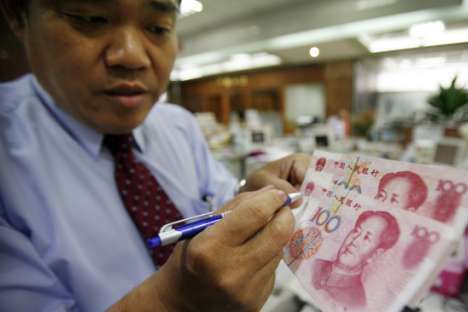 The Finance Ministry meanwhile said it was studying possible debt issues in yuan. "In general, study of the Chinese market's opportunities is under way," news agency RIA Novosti quoted Deputy Finance Minister Sergei Storchak as saying earlier this month. Yet it will take decades for the yuan to circulate on the scale of the euro, and even longer to challenge the dollar, which has the advantage of scale, said Sberbank CIB's Pantyushin. "It could rival the euro, but I doubt it on the dollar," he said. Material from Reuters was included in this article.